David Robert Gray, a young farmer from Lowcliffe, near Hinds, was one of the fourteen conscientious objectors who had the misfortune to be transported to Europe in July 1917. The Government’s aim was two-fold; firstly to demonstrate that if faced with the reality of front-line warfare, the conscientious objectors would capitulate. Secondly it was a useful deterrent to have hanging over the heads of potential objectors in New Zealand. But the Government's intention was to send those deemed ‘defiant’ objectors. David Gray, a member of the fundamentalist sect, the Testimony of Jesus, was a religious objector and sending him to Europe was a government error. 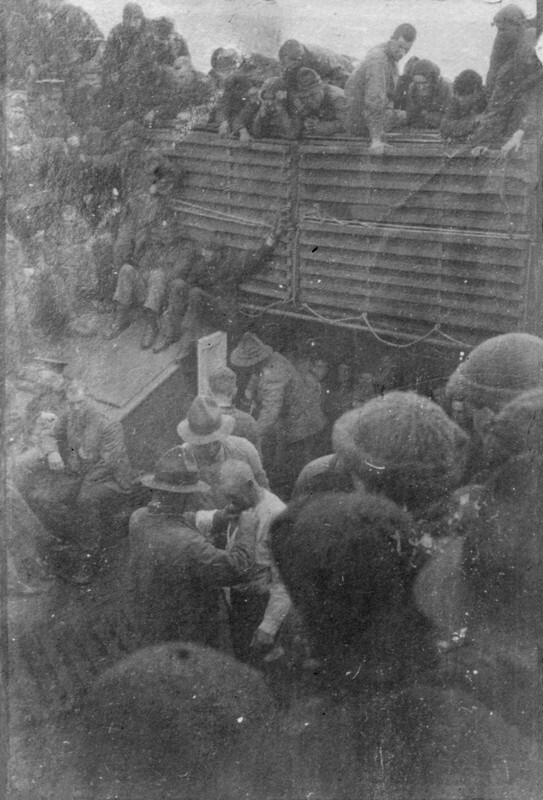 David Gray, is the soldier seated left who is watching a fellow conscientious objector (CO) being dressed in military uniform while on one of the transport ships that took ‘the fourteen’ to England. Very little is known about David Gray’s personal story, but some aspects of it can be pieced together from newspaper reports about other members of the Testimony of Jesus, and also from the account written by Archibald Baxter, one of the ‘defiant’ objectors, first published in 1939 as We Will Not Cease. The Canterbury Military Service Board, sitting at Ashburton, had first heard about the sect called ‘The Testimony of Jesus’ in January 1917 when Robert Clayton Patton, a contractor from Mt Somers had appealed - unsuccessfully against his conscription because he could not establish that ‘amongst the tenets and doctrines of the sect was a conscientious religious belief that the bearing of arms is contrary to Divine revelation’. To successfully appeal objectors also had to have held their beliefs from a period before 4 August 1914, that is, before the war started. The cases of the four brothers in the Gray family: John Gray, blacksmith, of Coldstream and Samuel Gray, William George Gray, and David Robert Gray, all farmers and shearers of Lowcliffe, was heard on 7 February 1917. All four of the ‘diffident young men’ said that they had belonged to the Testimony of Jesus for about two and a half years, and were appealing solely on religious grounds. It did not help their case that one of the brothers said that they had adopted a ‘non-combatant’ religion after the war started. They were told that two of the family would have to serve and as David Robert Gray had no land, he and his brother John, the blacksmith, had their appeals dismissed. William and George were allowed to stay on their farms and take their chances in the ballot. When asked if he would be prepared to do non-combatant work in the Medical Corps or Army Service Corps, Robert Patton replied that he would not. There is no specific mention in newspaper reports of what the Gray brothers replied to this question but presumably they also would have refused to do non-combatant work on the grounds that such work was still under military authority. A test case in Wellington a few months later sheds further light on the sect. Sir John Findlay QC appeared for 18 members of the sect which numbered between 700 and 800 members in New Zealand, with 24 ministers or evangelists. The sect had existed for more than 20 years and had 5000 members in England. It had no written constitution but adopted the New Testament teachings; membership was dependent on a willingness to observe the teachings of Christ in everyday life. The evangelists, who had to have given away all their possessions to the poor, were chosen at annual conventions and were dependent on voluntary contributions. The sect believed that the bearing of arms was forbidden by Christ. The appeals in this case were dismissed despite the fact that these appellants were prepared to do non-combatant work. Archibald Baxter, first met David Gray in the ‘clink’ of the aged and barely seaworthy transport ship the Waitemata. It was a room of roughly 20 feet by ten with two tiers of bunks running around it and portholes on one wall. Baxter's view was that the fourteen had been chosen because of their obscurity: ‘[B]eing thought unlikely ever to make our protests heard either personally or through our relatives.’ He also noted that they were all either from the proletariat, or else were already known as opponents to the government. Bad weather and sea sickness led to a miserable few days at the start of the voyage. The fourteen resisted all efforts that were made to force them to wear uniform but otherwise seem to have been largely left alone. David Gray is included in a rare and rather indistinct photo of ‘some of the fourteen being dressed in uniform’ which has been reproduced in several publications. Several of the men came down with measles. When the ship reached South Africa it was condemned by the South African authorities and the fourteen men were split up. Archibald Baxter and two others were left in hospital in Cape Town to recover from the measles, the others, including Gray, travelled on to England by ships of the Union Castle Line. Archibald Baxter next met up with David Gray at Sling Camp in the south of England, soon after Christmas 1917 and found him dressed in uniform, heating up something in an oil drum over a fire. Gray explained that he was in uniform because the authorities had told him his case was different from the others. He was regarded as ‘genuine’ and he had been asked to wear uniform while they communicated with New Zealand and came to a decision about what to do with him. He had been expecting to hear that he would be sent back to New Zealand, but so far had not heard anything, and was filling in time doing some gardening around the camp. He told Baxter that he was beginning to wonder if it was all a ruse to get him to take on army service. They were forcibly dressed in uniform, their own clothes taken away and not returned to them. When they took the uniform off and went about in underclothes, their underclothes were taken away. They were hosed down and then dressed only in uniform. Though they had been brought out on deck in front of the passengers, they took the uniform off and went naked. After a while they managed to get underclothes again and went about in them. Before landing they were dressed in uniform again and some of them who refused to walk were dragged off. We had certainly missed hardships through having measles. It is not known what happened to David Gray after this meeting with Archibald Baxter at Sling. He appears to have remained at Sling Camp near Salisbury and then returned to New Zealand where he seems to have kept a low profile. Archibald Baxter, We Will Not Cease, (Auckland: Cape Catley, 2003), p.68. David Grant, Field Punishment No. 1, (Wellington: Steele Roberts, 2008), pp.40, 45, 47. ‘A Little-Known Sect: Testimony of Jesus’, Sun, 4 January 1917, p.9. ‘Military Service Board’, Dominion, 26 July 1917, p.9. ‘Testimony of Jesus’, Evening Post, 3 August 1917, p.7. Baxter, We Will Not Cease, p.68. Baker, Paul, King and Country Call: New Zealanders, Conscription and the Great War (Auckland: Auckland University Press, 1988), p.181. Baxter, We Will Not Cease, pp.67-75. Baxter, We Will Not Cease, p.92. Grant, Field Punishment No. 1, p.47; Baker, King and Country Call: New Zealanders, Conscription and the Great War, p.182.